Urban Sparks volunteers designed and built, with help from Backcountry Bicycle Trails Club, the Cascade Bicycle Club, Bike Works, the BMX community, Fremont Rotary, Red Bull and Trips for Kids, an extensive Bicycle Skills Park at Magnuson Park. It had singletrack trail, log piles, obstacles, skinnies, and BMX jumps for all ages to play and build skills on. The Skills Park was built as an outdoor test area for the Cascade Bicycle Club’s 2005 Bicycle Expo with expectations that we could keep it for a year of two after Expo. Unfortunately Parks’ plans for redeveloping the North Shore Recreation Area suddenly sped ahead when a permit that had been stuck in process for 5 years was finally granted. 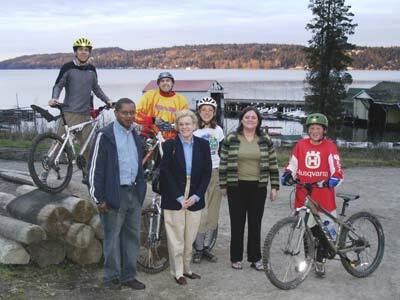 Although our Skills Park was replaced in the summer of 2005 with a smooth grassy hill, we were able to show Seattle Parks and Recreation what the bicycle community was willing to build with volunteer labor and very little cash. Great credibility was built with this project and with the I-5 Colonnade Mountain Bike Trail project under I-5. We expect our three years worth of efforts to pay off soon in the form of permission to build a permanent Bicycle Skills Park. Urban Sparks had planned a native species re-vegetation of the skills park area along with the bike facility. We commissioned a landscape design for the area and were planning on creating a “friends of” to take care of the site. We think it is important for the trails to be surrounded by attractive habitat that teaches respect for nature while keeping maintenance naturally low. We’re making sure to keep our work visible to the Mayor and City Council in addition to Parks management. We want them to know that Urban Sparks, with the backing of the cycling community, can build a great skills park where kids and adults can play together away from the danger of cars, much as skaters do in skate parks. The difference is that we build with dirt which is fast and inexpensive.